CHANCES are you’ve never heard of Jack Kirby but he deserves public recognition as a bona fide Northern Hero. The North was never short of footballers with scoring ability and popular appeal but Kirby had neither.Jack was a quiet, modest goalkeeper who in 1934 defied the concerted might of his Derby County Management, the British Government and his Nazi hosts and alone refused to salute fascism. 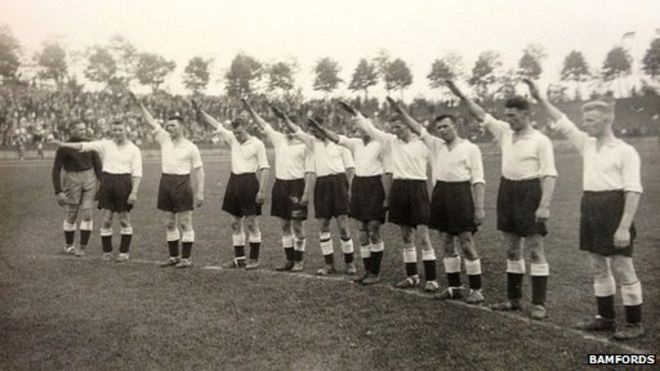 Hitler hated football but saw the game’s potential for showing off Nazi physical prowess. When he assumed power in 1933 Germany was a weak footballing nation that hadn’t participated in the 1930 World Cup but Hitler was determined to remedy that. The head of the German Football Association, Dr Otto Nerz, the man who brought Jack to Germany, shared Hitler’s view and not just on football. Nerz was a devoted member of the Nazi Party long before Hitler’s accession and was as determined as the Fuhrer to make the national team a model of Nazi success. To this end he travelled extensively studying successful foreign teams, including periods 'living-in' with Aston Villa, Glasgow Rangers and Arsenal. With Hitler running the state and Nerz running the F.A., German football was swiftly 'cleansed' of racially unacceptable players and managers but this didn’t concern the English F.A . The leaders of English football admired Hitler’s commitment to the game and were keen to cooperate in raising Nazi Germany’s international profile. Within a year of Hitler’s take-over Dr Otto Nerz had secured the agreement of the English FA for top team Derby County to tour Germany playing exhibition matches against a German FA XI. The British Government and almost all elements of the English Establishment were delighted at this public demonstration of our two nations’ shared values. 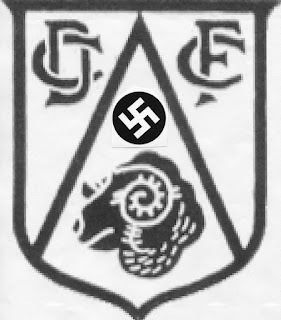 In February 1934 Dr Otto Nerz announced details of the Derby County tour to the international press telling reprorters, 'They play very attractive football and their style of play is likely to make a big appeal to Germany.' The tour awaited the English close season when Derby would play successive matches at Frankfurt, Cologne, Dusseldorf and Dortmund with the first kicking-off on 10 May. As soon as were met at their Frankfurt hotel by Otto Nerz they experienced no further obstructions as he chaperoned them around Germany ensuring that everywhere they were enthusiastically received. Specially translated English language menus were provided at eating places, dedicated guides provided and relaxing river trips on the Rhine organised. Jack Kirby was a Derby man through and through. Born at Overdean in South Derbyshire in 1910 there were Kirby’s all over the area and for generations they’d worked down the pit. Jack’s grandad was a miner, his dad was a miner and he never forgot his roots, When instructed to salute fascism Jack adamantly refused. As the photo shows, whilst the rest of the team followed orders, defying 35,000 chanting German football supporters Jack Kirby stood his ground and kept his arms by his sides. It was a gesture every bit as brave and powerful as the iconic Black Power salutes of the 1968 Olympics although in 1934 nobody mentioned it. This picture, taken by the accompanying Derby Telegraph photographer wasn’t published in the paper, nor was the incident reported. There was no protest from the Nazis, no apology from the British F.A. and simply no mention of Jack’s defiant gesture in any media outlet. It was fake Non-News, a conspiracy to keep quiet about an astonishingly brave public act of opposition to Hitler. Only after Jack Kirby’s death in Derby in 1960 did his old team mate George Jobey reveal Jack’s astonishing bravery, 'We did what we were told. All except our goalkeeper, Jack Kirby'. Jack died as he had lived, a quiet unassuming hero. Satisfyingly, his 1934 bete noire Dr Otto Nerz eventually received his come-uppance. Much admired by fawning English sports reporters as the, 'virtual dictator of German Football,' in 1945 Nerz was captured by the invading Red Army. Identified as an irredeemable Nazi, Dr Otto Nerz was interned in Sachsenhausen where he died of meningitis on 19 April 1949.